As indicated in Section 12.4 “Strong and Weak Acids and Bases and Their Salts”, weak acids are relatively common, even in the foods we eat. But we occasionally encounter a strong acid or base, such as stomach acid, which has a strongly acidic pH of 1.7. By definition, strong acids and bases can produce a relatively large amount of H+ or OH− ions and consequently have marked chemical activities. In addition, very small amounts of strong acids and bases can change the pH of a solution very quickly. If 1 mL of stomach acid [approximated as 0.1 M HCl(aq)] were added to the bloodstream and no correcting mechanism were present, the pH of the blood would decrease from about 7.4 to about 4.7—a pH that is not conducive to continued living. Fortunately, the body has a mechanism for minimizing such dramatic pH changes. 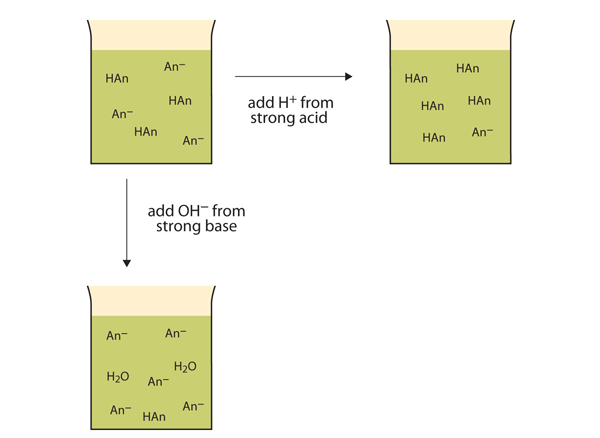 Rather than changing the pH dramatically and making the solution acidic, the added H+ ions react to make molecules of a weak acid. Figure 12.2 “The Actions of Buffers” illustrates both actions of a buffer. Buffers can react with both strong acids (top) and strong bases (side) to minimize large changes in pH. CH3NH2 is methylamine, which is like NH3 with one of its H atoms substituted with a CH3 group. Because it is not listed in Table 12.2 “Strong Acids and Bases”, we can assume that it is a weak base. The compound CH3NH3Cl is a salt made from that weak base, so the combination of these two solutes would make a buffer solution. The structure of aspirin is shown in the accompanying figure. The acid part is circled; it is the H atom in that part that can be donated as aspirin acts as a Brønsted-Lowry acid. Because it is not given in Table 12.2 “Strong Acids and Bases”, acetylsalicylic acid is a weak acid. However, it is still an acid, and given that some people consume relatively large amounts of aspirin daily, its acidic nature can cause problems in the stomach lining, despite the stomach’s defenses against its own stomach acid. The circled atoms are the acid part of the molecule. Define buffer. What two related chemical components are required to make a buffer? Which combinations of compounds can make a buffer? Assume aqueous solutions. 4. Which combinations of compounds can make a buffer? Assume aqueous solutions. 5. For each combination in Exercise 3 that is a buffer, write the chemical equations for the reactions of the buffer components when a strong acid and a strong base is added. 6. For each combination in Exercise 4 that is a buffer, write the chemical equations for the reactions of the buffer components when a strong acid and a strong base is added. 7. The complete phosphate buffer system is based on four substances: H3PO4, H2PO4−, HPO42−, and PO43−. What different buffer solutions can be made from these substances? 8. Explain why NaBr cannot be a component in either an acidic or a basic buffer. 9. Two solutions are made containing the same concentrations of solutes. One solution is composed of H3PO4 and Na3PO4, while the other is composed of HCN and NaCN. Which solution should have the larger capacity as a buffer? 10. Two solutions are made containing the same concentrations of solutes. One solution is composed of NH3 and NH4NO3, while the other is composed of H2SO4 and Na2SO4. Which solution should have the larger capacity as a buffer? A buffer is the combination of a weak acid or base and a salt of that weak acid or base. 3b: strong acid: NO2− + H+ → HNO2; strong base: HNO2 + OH− → NO2− + H2O; 3d: strong base: NH4+ + OH− → NH3 + H2O; strong acid: NH3 + H+ → NH4+7. The phosphate buffer should have the larger capacity. Buffers by Jessie A. Key is licensed under a Creative Commons Attribution-NonCommercial-ShareAlike 4.0 International License, except where otherwise noted.